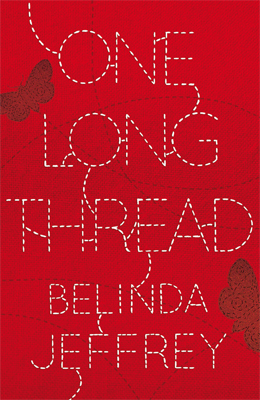 One Long Thread by acclaimed storyteller Belinda Jeffrey is a beautiful and engaging tale following on from the story thread first introduced in her novel Brown Skin Blue, in which a boy named Barry Mundy befriends Sally, a teenage girl who works for a croc jumping cruise. Jeffrey's previous books have received overwhelming praise and recommendations from reviewers since publication and have been enjoyed by readers of all ages who recognise themselves in her Australia-inspired stories. In One Long Thread we meet twins Ruby and Sally Moon, cut from the same cloth but as different as night and day. While Sally is bold and adventurous, Ruby is quiet and creative. When divorce splits their family in two and Sally moves with their mother to the Northern Territory, Ruby holds onto the thought that one day her family will be complete, again. But when tragedy strikes, wrapping Sally in a cocoon from which she might never escape, Ruby runs away to Tonga, confused and in pain. Working alongside her grandfather who produces silk on a small hobby farm, Ruby finds hope watching the small journey of the silkworm in its pursuit of life, beauty and freedom. There she discovers that secrets and the threads that bind families together, might just weave her future. those cocoons were like golden moments, every last one of them. Not everyone makes it out, or finds love and hope outside their own small shells. But there, among the thousand chances, is but a few who could. And who would. The inspiration for One Long Thread came to Jeffery while driving home with a friend and recounting the story of her own grandmother whom she'd not seen for many years. Her friends turned off the highway with the view to tracking down her long-lost relative. Jeffrey recalls "I knocked on the door of her small unit. A woman came to the door, the door opened. "I know who you are", she said. "I know exactly who you are. I've been waiting for someone to come and find me". In her lounge room, surrounded by her many craft projects, her oxygen tank and photograph albums, she began telling me some of the stories of her life. She had been forced to leave her children and grandfather when my father, the eldest child, was ten. She apologised to me that day, saying she felt so bad for leaving, but feared for her life if she'd stayed. I had always wanted to know about her heritage and I asked about her parents. "I know almost nothing about them," she said. "They had no room for kindness. I found out I was pregnant at fifteen. My mother took my only winter coat, which was beige, and dyed it bright red. She gave me a small suitcase and put me on a train to marry your grandfather." "Sometime after her funeral, I was playing with ideas for a novel when a friend asked why I didn't write bout girls. I had no answer. I had been toying with a story about another boy, but her question made me think. The first thing that came to mind was a generation of women, all inevitably linked and the story of that red coat, which begins this novel." In One Long Thread, Jeffrey has created richly drawn characters and a captivating story about love, sisterhood and the family ties that bind us, that will move readers long after the last page is turned. Belinda Jeffrey's young adult fiction is acclaimed for its arresting characters and vivid descriptions. Her impressive debut, Brown Skin Blue was shortlisted for last year's Western Australian Premier's Literary awards. Her second novel, Big River, Little Fish was inspired by summer holidays spent at her father's shack on the Murray River, South Australia and has been described as 'a quintessential Australian novel'. Her latest novel is One Long Thread.